February 14, 2007 Albuquerque, New Mexico – On January 26, 2007, I posted a 3-part Earthfiles entitled “Tappen, North Dakota: Encounters with Non-Humans” in text/images and podcast. That night on Coast to Coast AM with George Noory, I also reported about the Tappen, North Dakota, cattle ranch family that have had an extraordinary series of events occur since October 2005. “I read about the recent experiences of a farming family in Tappen, North Dakota, and the death of their sow and other problems they have encountered relevant to possible encounters with unusual craft and beings. I will try and respond as per your request to hear from experiencers of such events. I have decided the best way to begin is from the most recent experiences I have had and work back in time from those. My most recent sighting event was on January 27, 2007, around 11 PM at night or later…can’t be exact on this as I was outside feeling compelled to ‘sky watch,’ as is often the case. After some time, I observed two large, bright, white lights moving at tree-top level in the east. We live in a country/forest type out-of-the-way location. I thought at first they may have been landing lights turned on as the Shreveport airport here in Louisiana often has planes come in over this flight path direction and the lights can be startling at first. It turned out not to be the case this time, the lights were moving very slowly together, from north to south direction in the area. They then hovered for about 10 seconds and then went back northerly and hovered again. They did this kind of maneuver for about 10 minutes or so before finally disappearing without changing in size. They were about the size of 2 golf balls held at arms length, seemed fairly good-sized…..just fading away. No sound involved at all with these lights and I got the impression that they were acting independently of each other and not connected to one airborne craft. About one hour after the objects disappeared, I observed a very bright flash of light and white object/streak, at altitude, extremely high and fast, on a direct easterly heading. No sound and the light was rapid and in view for short duration…about 3 seconds?? I felt very tired after all of this and went to bed and had an extreme urge to fall asleep, which is very unusual for me…I have sleep problems. I woke the next day with extreme eye irritation which lasted for about one week duration. I was watching History Channels UFO Files when I heard of 2 separate UFO witnesses complain of eye irritation after a sighting…like eye burns from a welding incident and that sounded exactly like what I was feeling/experiencing. The above is just the ‘tip’ of the iceberg…I have been an experiencer since around 4 yrs. old, in New Jersey, around July 1946. Once, when driving at night from my hospital work as a nurse, I had about 20 min. of missing time, involved me AND my car and ending up in a totally different location after a bright light came upon me from above/behind. An intense ‘vibration’ feeling was involved and a voice/feeling in my head realizing that such had occurred to me before and not to be afraid. I had an experience in the 1980s where I remember being transported from my home in Haughton, La., at night, to a craft hovering outside in the wooded area where we lived at the time. Most memorable was the fact that I was put into a tank of some kind of thick fluid…the tank was about 7 feet long, 4 ft. wide and about 2 1/2 ft. deep. I saw four of what are now called the ‘greys,’ peering over me….about 4 ft. tall or so. “I’m 58 now, and when I was about 14-15, I was camping out in the woods with my buddies in Chatham, NJ. We were sitting around a fire and I noticed an orb in a tree less than 20 feet away about 8 feet up. Trying to stay as calm as I could, I asked my friends to look up in the tree. I looked away and they screamed and then it disappeared. It was a luminescent orb about 16” in diameter bluish /greenish glow. 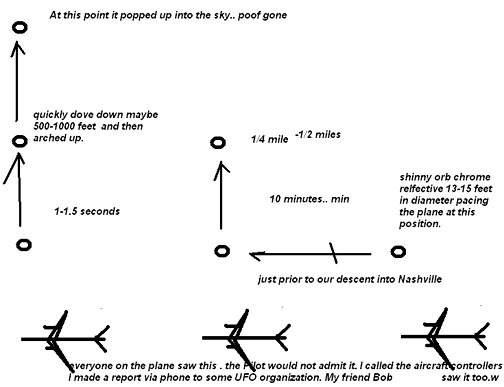 20 years ago (1987) while going to a plastics convention in Nashville, I saw a shinny sphere, maybe 13-15 feet in diameter – chrome, like a chrome marble, tracking our plane. It stayed in the same relative position for at least 10 to 15 minutes prior to diving down and then popping up vertical. Once it arched up from the dive. The time of this transition was maybe 1 to 1-1/2 seconds. During this maneuver, the chrome sphere kept pace with the plane. At this point, I grabbed him by the shirt collar and shook him. Sketch of chrome sphere’s movements in relationship to airliner in 1987 en route to Nashville, Tennessee. Sketch prepared by eyewitness. “I have seen three UFOs in my 58 years on this earth. The first UFO I saw was when I was 6 or 7 years old about 1955 or 56. I was at a boarding school in Westchester, NY, called Graham School. This school overlooks the Hudson River. I was coming out of the front of the main building which overlooks a field. It was after watching a movie that started at about 6 PM and was over about 7:30 PM. I was told to look up and there it was, a large black disk with about 12 different colored lights spinning slowly in a clockwise direction. It made no sound. I could not see the sky for at least fifty feet in any direction. The disk-like object seemed to be about fifty feet above us. We all stared at the object for what seemed to be 2 or 3 minutes. Then the disk-shaped object went straight up and zigzagged to the west and out of sight in about 2 seconds. We seemed to be the only ones up and the whole house was dark and everyone was asleep. Everyone in the house was to be in bed by 9 PM or 10 PM at the latest for the older boys. Yet, the movie was only an hour or so? For some reason nothing more was said about the black disk. I never mentioned it to anyone until I was in my twenties! The second UFO that I saw was in Upper Manhattan about 1986. I was walking my dog in Inwood Park near the Hudson River. I looked up and saw this large green light. It was in a circle and about the size of a small airplane. It was about 200 feet up and slowly going over the Henry Hudson Bridge heading east toward the Bronx. It made no sound and slowly moved out of sight to the east. “I listened to your Coast broadcast the other night (January 26, 2007) about the UFO encounter in North Dakota. The experiences I have had are not nearly as dramatic, but I thought I would e-mail you the one that I think is the most unusual. In the spring of 1985 in Moscow, Idaho, at approx. 8:00 AM in the morning, I woke up, got out of bed and reached for my robe. It was bright and sunny and a slight breeze was blowing through the open window above the bed. The window was propped open and there was no screen. As I was putting my robe on, I looked over to where my now ex-husband was still sleeping. There about 3ft. above and to the right of him was a metal looking canister shaped UFO hovering in the air. It resembled a large coffee can with a top like a grain silo. A pink, pencil-thick beam of light was coming out of it and was aimed at my ex-husband, moving slowly across his face just above his right eyebrow. I moved to the foot of the bed and watched it for a minute or so and then moved closer to within touching distance of it. I tried to get up the courage to touch it and reached out 3 times. The third try seemed to alert the UFO as it got still, pulled in the beam and shot out the open window. “It was Nov. 1959. We lived on a bluff overlooking the Illinois River in Peoria, Illinois. There were large picture windows in the bedroom. I awoke at about 5:00 AM. I had a baby of a few months. Out the picture window just over the bluff, there was a huge, bright, white light. It was oblong like the shape of a blimp. It made no sound, but it appeared to vibrate or move slightly. There was a contrail type part. All of a sudden this tail raised and the thing shot across the river and over the hills on the other side of the river and out of sight. It went very fast. It had been very near the house—maybe 300 feet away at eye level. When the first national news came on the radio, it said that an unexplained object had been seen over 3 states and had been chased by planes from the Naval Air station in Chicago, but it had gone so fast it could not be caught. A neighbor also living on the river bluff and up with a new baby saw it also, as did my husband. I called the airport and they said they had watched it from the tower. A radio station had a roving reporter called ‘Big Red’ who drove around all night. I called the station and they said he had watched it for some time over the river. I called our newspaper and gave the story to the newsroom. “Last summer, multiple reports came in about plane crashes in the swamp near the Augusta Airport – several reports over a couple of weeks. My husband and I saw something. My husband saw it first. He came home from work and told me that he saw something that looked like a meteor, only it was not going down. It was going across the sky. About two weeks later, we were driving home when we saw something strange. This is where it gets weird. My memories and my husband’s are not the same. They don’t seem to take place in the same area. I remember being at Highway 25 and Willis Foreman Road and looking up out of the passenger side of the truck. I saw a large object hovering above the trees. The instant I looked up, the sky lit up like daylight, extremely bright, white light. I remember a blue-white light illuminating the inside of cars passing by. But that particular memory is strange and feels wrong to me – I don’t know why. Anyway, when the sky lit up, the craft took off. The blue-white light moved so fast, it was not like it was flying. It was like it jumped through space and reappeared off in the distance. When it reappeared, several small white balls of light came from it and started moving at tremendous speed, changing direction rapidly. They just zigzagged all over the place. I continued to see them almost all the way home that night. My husband remembers the incident occurring at a different location on the same road. I saw several things in the sky a few weeks later, maybe 15 or 20 white lights moving to the south fairly quickly. Now calls are coming in again here about plane crashes in the swamp. They started about three weeks ago in January 2007. And my husband saw them again a few nights ago. It was extremely overcast. You should not have been able to see the stars or anything else. But he saw them. He said there were several of them and the lights glowed blue and red and white. They glowed very bright and then blinked out.